How to print/upload (a web-page) directly into my Google Drive account? Is it possible to, from the OS X 10.6 print dialog, print the web-page directly into my Google Documents account? I can save as PDF and upload it, but, well, I want to cut out the middleman (ie, me; I make too many mistakes...). I tend to use Chrome to browse the web in case that's relevant. Are there Google Docs upload-helpers in general? I tried gdocuploaded (an Adobe AIR App) but it refused to so much as launch. Update – March 25, 2012: The old workflow stopped working due to changes in the Google APIs. This one should fix it. Follow step 1 below, then download the new version of the workflow. Then, install the Google Command Line tools over it. The Google Command line tools allow you to access Google services over the command line. To do that, you have to first authorize your computer to access Google. It will prompt you for your username first. After you've entered it, you'll get to your Google account page. Click "Grant Access" and then copy the bold verification code that looks something like x9rS2qPNUb from the website. Paste it into the Terminal again and hit enter. Now GoogleCL is authorized and will list all your Google Docs. Neat. We can use these tools to upload files to your Docs without ever needing to open an application. If you want to skip the next part, download the workflow from step 4. If not, download the shell script here. Copy the contents of this script, we'll need it later. We're almost there. If you want to skip the following, download the workflow from my Dropbox account. If that ever goes offline, see my github repo for it. Unzip and copy the workflow file to /Users/username/Library/PDF Services. You're done. 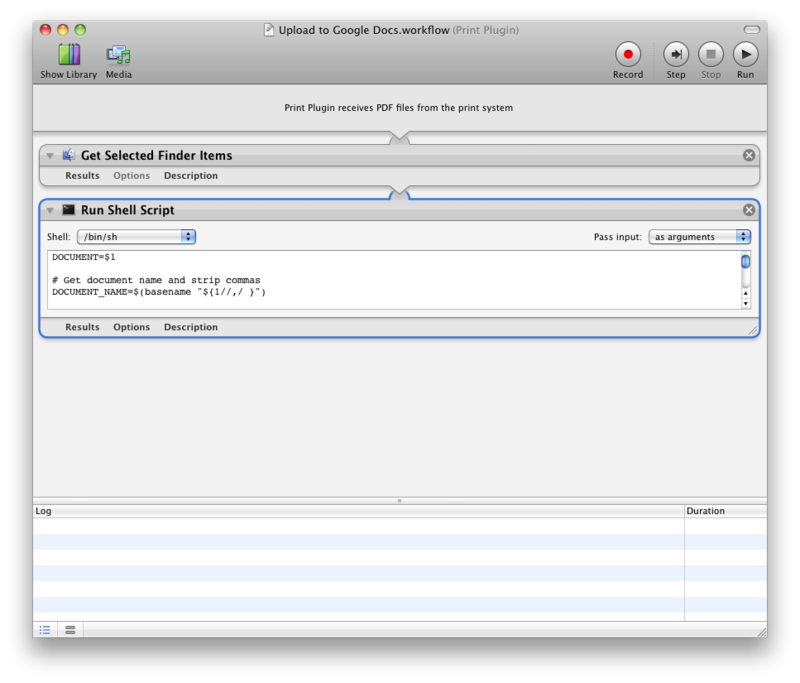 From the left, search for "Get Selected Finder Items" and drag that to the right pane. Now, search for "Run Shell Script" and drag that to the right too. In the header of "Run Shell Script", change the "Shell" to "/bin/sh" and the "Pass Input" option to "As arguments"
Now paste the contents of the shell script into the box below. Go to File → Save As and enter a name, for example "Upload to Google Docs". 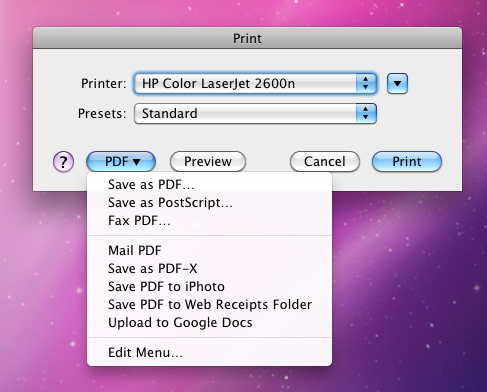 The workflow is now available in the PDF menu when you print anything. From anywhere. You can now "print" to Google Docs from your Mac. In fact, it will also open the file you just uploaded to view it in your browser. If you want to disable that and "silently" upload, remove (or uncomment with #) the lines in the script that say open $URL. The main print dialog closes, and the Could Print dialog comes up. "Save to Google Drive" will be the first option. Select "Print" and it will create a print job and close the dialog when done. The PDF will appear in your root folder of Google Drive. Save PDF, images or webpages - opened in Chrome - to your Google Drive. The Save to Google Drive Chrome extension helps you save web content or browser screenshots to your Google Drive. The directory location and format of saved HTML pages can be controlled with the extension's options page. Not the answer you're looking for? Browse other questions tagged macos printing google-docs or ask your own question. How can I print all of web page “Are you generic” by Wilson Miner? How do I print unprintable web pages? Get a web page with print stylesheets?